C/Castelar 24, 41001 Sevilla, Spanien. 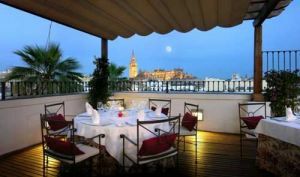 Hotel Vincci La Rabida is a boutique hotel, located in an 18th century palace in the heart of old Seville. Just a stroll away from the famous Cathedral and the Bull-fighting arena, known as the Maestranza. 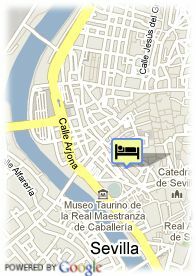 The quarter, in which the hotel is located is called El Arenal and is known for its diversity of typical restaurants. This hotel offers 79 well-equipped rooms with television, phone, air-conditioning and bathroom. ältere Kinder und Erwachsene: 58.85 € pro zusätzliches Bett.